great-sounding and great-looking drums, handmade by drummers for drummers. 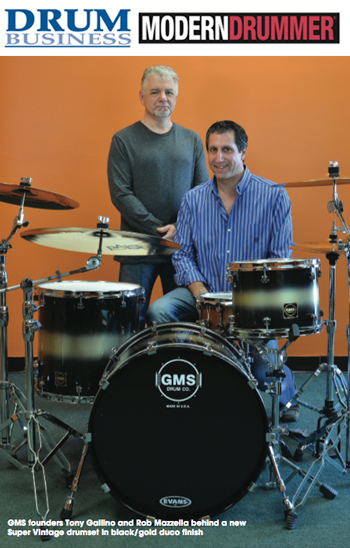 That’s been the GMS way since the Long Island natives Rob Mazzella and Tony Gallino began building custom snare drums twenty-six years ago. a clear demand for it, as Rob and Tony soon found out when orders came pouring in after their NAMM Show debut in 1988. From there on out, GMS would be widely regarded as one of the world’s premier custom-shop drum makers. a feel for how he and Gallino are primed to adapt to today’s ever- evolving music industry.